This article is about the town in Scotland. For the town in Canada, see Rothesay, New Brunswick. For other uses, see Rothesay (disambiguation). Rothesay /ˈrɒθ.si/ ( listen) (Scottish Gaelic: Baile Bhòid) is the principal town on the Isle of Bute, in the council area of Argyll and Bute, Scotland. It can be reached by ferry from Wemyss Bay which offers an onward rail link to Glasgow. At the centre of the town is Rothesay Castle, a ruined castle which dates back to the 13th century, and which is unique in Scotland for its circular plan. Rothesay lies along the coast of the Firth of Clyde. 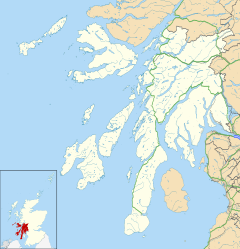 In modern Scottish Gaelic Rothesay is known as Baile Bhòid meaning "town of Bute". The English language name, described as "Rothersay" in 1321, "Rosay" c. 1400 and "Rothissaye" about 1500 originally referred to the castle. This structure had a moat connected to the sea and the name may have originally meant "Rother's Isle" (Old Norse -ey meaning "isle") or be a corruption of the Gaelic rath meaning "fort". The old town centred around Rothesay Castle, which dates from the 13th century. Long-ruinous it is nevertheless picturesque, and formed a focal point for tourists from the beginning of its evolution into a seaside resort. Rothesay was the county town in the civil parish of Rothesay in county of Bute, which included the islands of Great Cumbrae, Little Cumbrae and Arran. The county buildings, now partially closed down, overlook the castle. During the Victorian era, Rothesay developed as a popular tourist destination. It became hugely popular with Glaswegians going "doon the watter" (lit: down the water, where the 'water' in question is the Firth of Clyde), and its wooden pier was once much busier with steamer traffic than it is today. Rothesay was also the location of one of Scotland's many hydropathic establishments during the 19th century boom years of the Hydropathy movement. The town also had an electric tramway - the Rothesay and Ettrick Bay Light Railway - which stretched across the island to one of its largest beaches. However, this closed in the mid-1930s. The centre of activities was the Winter Gardens building (built 1923) which played host to some of the best known music hall entertainers of the day. During World War II Rothesay Bay was the home port of HMS Cyclops, the depot ship for the 7th Submarine Flotilla. HMS Cyclops and the 7th Submarine Flotilla served as the training facility for virtually all British submariners who saw service during the war. The Officer Concentration Station Rothsay was located here in 1941-1942. The war memorial (1922) is by Pilkington Jackson. The Bauhaus-inspired Rothesay Pavilion of 1938, is designed by the Ayr architect, James Carrick. It is a major landmark on the seafront. From the 1960s onwards, with the advent of cheap foreign package holidays, Rothesay's heyday was largely over. The Winter Gardens closed and lay derelict for many years. However, in the 1990s, it was redeveloped and is now a tourist information and exhibition centre. The heir to the British throne (now Charles, Prince of Wales) is known in Scotland as the Duke of Rothesay. This practice was begun by Robert III, who regularly resided at Rothesay Castle, and first granted the title to his son David in 1398. At that time, Rothesay was the name used for the island rather than the town (which was known as Bute-town). The isle (with Arran) had been under the control of the Stewart family since Robert III's great-grandfather Alexander Stewart was assigned it by the then king (after its transfer from Norway); when Alexander Stewart's grandson, Robert's father, inherited the throne from his mother, it became the property of the crown. The title has subsequently always been given to the heir of the Scottish throne; after the Union of the Crowns, in 1603, this became the heir to the British throne. Unlike the equivalent English title of Duke of Cornwall, there is no land attached in the form of a Duchy. Control of the land had been handed to Robert III's half-brother, and the latter's descendants, who acquired the title Marquess of Bute in the 18th century; the Marquess remains the main landowner on the island, and has his principal seat, Mount Stuart, a few miles to the south. Rothesay is no longer the seaside town it used to be, with more tourists going to warmer countries such as Spain. However, since the recession tourist numbers have increased. Rothesay was granted a multimillion-pound harbour development project just in time for an arrival of the next generation lower firth ferries Argyle and Bute. In August 2018, Donald Campbell's Bluebird held trials on Loch Fad. It was the first time back in the water since it was recovered from Coniston Water in the Lake District. Rothesay has hosted the National Mòd twice: in 1908 and 1952. The most successful sporting club on the island is Bute Shinty Club which has played at the highest level of the sport (the Marine Harvest Premier League). In 2006 Bute won promotion to the Premier League by winning the South Division One. Bute are also multiple winners of the Balliemore Cup. The town has an amateur football club called Rothesay Brandane A.F.C. (nicknamed "The Danes") which was founded in 1946. They played in the Scottish Amateur Football League starting in 1947; they reached the semi-final of the Scottish Amateur Cup in 1948–49 and won the league in both 1963-64 and 2000-01 seasons. In 2004 they transferred to the Caledonian Amateur Football League Division 2 and currently play in Division 1 after winning promotion after the 2007-08 season. They also had an under-15 youth team called Rothesay Brandane Rovers. Bute Rangers F.C. were a separate football club from the town which competed in the Scottish Cup in the 19th century. Bute County Cricket Club plays in the Western District Cricket Union Championship. The island has three golf courses, one of which is situated on the outskirts of the town, the 18-hole Rothesay Golf Club, another, the 9 hole Bute Golf Course, near the sands of Stravannan Bay on the west coast of the island, and the other, the rather unusual, 13 hole Port Bannatyne Golf Club, situated on the hills behind the village. There are also two putting greens on the town's seafront. The town hosts the High School of Glasgow rugby camp every summer. There are currently three primary schools; St Andrews Primary, Rothesay Primary School, North Bute Primary and one secondary school, Rothesay Academy, in the town. In 2007 a joint campus school was opened merging Rothesay Primary with Rothesay Academy. Rothesay Academy has now closed in favour of the joint campus school. John Stuart, 3rd Earl of Bute, First Scottish Prime Minister of Great Britain is buried in St Mary's Chapel, Rothesay. As with the rest of the British Isles and Scotland, Rothesay experiences a maritime climate with cool summers and mild winters. Given its island location, the risk of severe frost is negated by the surrounding waters. Temperature extremes range from 28.5 °C (83.3 °F) during August 1975, down to −8.4 °C (16.9 °F) during January 1982. ^ Bradley, James; Dupree, Mageurite; Durie, Alastair (1997). "Taking the Water Cure: The Hydropathic Movement in Scotland, 1840-1940" (PDF). Business and Economic History. 26 (2): 429. Archived from the original (PDF) on 29 April 2005. Retrieved 17 November 2009. ^ Shifrin, Malcolm (3 October 2008). "Victorian Turkish Baths Directory". Victorian Turkish Baths: Their origin, development, and gradual decline. Retrieved 12 December 2009. ^ "Donald Campbell's Bluebird hydroplane returns to water". BBC News. 4 August 2018. Retrieved 18 August 2018. ^ a b Polea, John. "Rothesay Brandane Football Club". Retrieved 10 March 2017. ^ "Nostalgia: Rothesay Brandane's title win - 15 years ago this week". The Buteman. Rothesay. 23 April 2016. Retrieved 5 March 2017. ^ "Brandanes' promotion is signed and sealed". The Buteman. Rothesay. 22 May 2008. Retrieved 5 March 2017. ^ "John Colum Crichton-Stuart". The Peerage. Retrieved 16 March 2013. ^ "Gillies, Thomas Bannatyne". Dictionary of New Zealand Biography. Te Ara - the Encyclopedia of New Zealand, updated 30 October 2012. Retrieved 16 March 2013. ^ "(George) Leslie Hunter". Gazetteer for Scotland. Retrieved 16 March 2013. ^ "Biography for Ashley Lilley". Internet Movie Database. Retrieved 16 March 2013. ^ Iain F. Russell (2004). "Macewen, Sir William (1848–1924)". Oxford Dictionary of National Biography. doi:10.1093/ref:odnb/34720. Retrieved 16 March 2013. ^ "Jim McAlister". Dundee FC. Archived from the original on 12 December 2013. Retrieved 16 March 2013. ^ "Jane Ross". Scottish Football. Retrieved 16 March 2013. ^ "Sir Graham WATSON". European Parliament. Retrieved 16 March 2013. ^ "Child star Lena dies at 35". BBC News. 2 October 1999. Retrieved 16 March 2013. ^ "Averages for Bute". KNMI. Johnston, James B (1892) “Place-Names Of Scotland” . Edinburgh: David Douglas. Archive.org. Retrieved 12 May 2018. Watson, W. J. (2004) The Celtic Place-Names of Scotland. Edinburgh. Birlinn. ISBN 1-84158-323-5. First published 1926. Wikimedia Commons has media related to Rothesay. Bute at War Rothesay's role during World War II as the home port of HMS Cyclops and the 7th Submarine Flotilla. This page was last edited on 18 March 2019, at 08:43 (UTC).